Clara Bewick was born in England on Aug. 5, 1846. She spent her early childhood in England with her grandparents while her parents and siblings endured poverty and hardship after emigrating to America. When she was 9, her family sent for her. After a childhood of much hardship, but with the support of her grandparents who also emigrated, she went to college and met a dashing military man, Leonard Colby. They married on June 23, 1871. She founded the Women’s Tribune in Beatrice, Neb., in 1883 and moved the paper, which became the leading women’s suffrage publication in the nation, to Washington, D.C., in 1886. 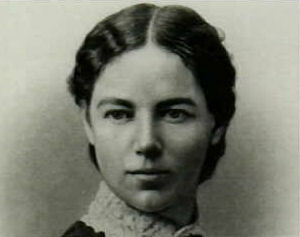 She spent several months in Washington each year working on the Tribune and for suffrage. She and Leonard had no children of their own, but she gracefully took on the job of raising Lost Bird when her husband adopted the child in 1891. She struggled to raise her child and continued to be very active over the years in the suffrage movement in the U.S. and in Great Britain, despite being left impoverished by her husband, who left her for Lost Bird’s nursemaid. She counted among her friends Susan B. Anthony and Elizabeth Cady Stanton, the leaders of the suffrage movement; Dr. Mary Walker, the Civil War physician who was the first woman to win the Medal of Honor; plus the wives of presidents and other prominent leaders, connections that her husband would make use of over the years to promote his own career. She made many mistakes as she reared Lost Bird. Clara tried to raise her Lakota daughter to be an independent-minded white woman - a copy of herself. But Clara ended up with an unruly unhappy child who fit into neither Lakota or white culture. Sinking further into poverty, unable to get her husband to pay alimony or contribute more to the support of their adopted daughter, she closed the Women’s Tribune in 1909. Eventually, Clara was forced to campaign and lecture to support herself, no matter what the weather and despite her declining health. She died of pneumonia on Sept. 7, 1916, penniless and unable to help her struggling daughter in San Francisco. The 19th Amendment, a goal to which she gave her life, was ratified on Aug. 26, 1920. Sources: "Lost Bird of Wounded Knee: Spirit of the Lakota" by Renee Sansom Flood, Nebraska State Historical Society, Gage County Historical Society.